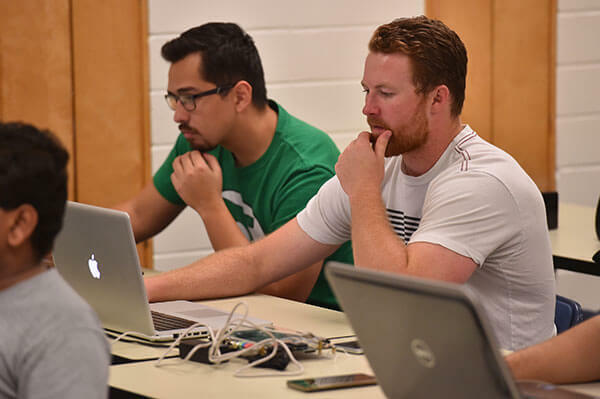 The Certificate in Software Engineering at St. Mary’s is offered online and provides students with the knowledge and the skills necessary to apply sound engineering theory, principles, tools and processes, as well as principles of computer science and mathematics, to the evaluation, design, development, testing and maintenance of complex software systems. This program is designed to serve the needs of individuals who would like to increase their knowledge and skill levels in the field of software engineering in a short time frame. It is important to note that this certificate program does not focus on providing students with a large repertoire of programming skills that emphasize particular language syntax. Coding is only one phase of the software life cycle. Instead, the program gives students the knowledge and skills necessary to develop and manage large-scale software systems with a primary focus on quality, reliability, and maintainability. It emphasizes the organizational structures, development processes, analysis and modeling techniques, design methodologies, documentation standards, and quality controls. Students will learn all aspects of software development, including software project management, system specifications, requirement analysis, design techniques, documentation, coding, testing, maintenance, quality assurance, and configuration management. Students who successfully complete the certificate program are highly encouraged to continue and earn their Master of Science degree in Software Engineering by taking six additional courses and complete a capstone project or five additional courses and a thesis. Applicants must have a Bachelor of Science degree in Software Engineering, Computer Science, Computer Engineering or a closely related discipline. Applicants whose Bachelor of Science degree is not in Software Engineering, Computer Science or Computer Engineering are required to demonstrate proficiency in the following subjects or take the corresponding prerequisite courses at St. Mary’s University or other institutions. St. Mary’s offers various scholarships, grants and assistantships to graduate students. Military, their dependents and Department of Defense employees may be eligible for a tuition discount. Please contact the Office of Financial Assistance at 210-436-3141 or finaid@stmarytx.edu for additional information or visit www.stmarytx.edu/finaid.